Dengue (pronounced DENgee) fever is a painful, debilitating mosquito-borne disease caused by any one of four closely related dengue viruses. These viruses are related to the viruses that cause West Nile infection and yellow fever. The Indian subcontinent,Southeast Asia,Southern China,Taiwan,The Pacific Islands,The Caribbean (except Cuba and the Cayman Islands),Mexico,Africa,Central and South America (except Chile, Paraguay, and Argentina). Most cases in the United States occur in people who contracted the infection while traveling abroad. But the risk is increasing for people living along the Texas-Mexico border and in other parts of the southern United States. 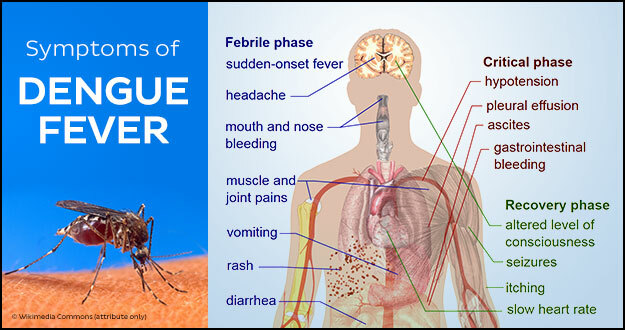 In 2009, an outbreak of dengue fever was identified in Key West, Fla.
Dengue fever is transmitted by the bite of an Aedes mosquito infected with a dengue virus. The mosquito becomes infected when it bites a person with dengue virus in their blood. It can’t be spread directly from one person to another person. Sometimes, symptoms are mild and can be mistaken for those of the flu or another viral infection. Younger children and people who have never had the infection before tend to have milder cases than older children and adults. However, serious problems can develop. These include dengue hemorrhagic fever, a rare complication characterized by high fever, damage to lymph and blood vessels, bleeding from the nose and gums, enlargement of the liver, and failure of the circulatory system. The symptoms may progress to massive bleeding, shock, and death. This is called dengue shock syndrome (DSS). People with weakened immune systems as well as those with a second or subsequent dengue infection are believed to be at greater risk for developing dengue hemorrhagic fever. There is no specific medicine to treat dengue infection. If you think you may have dengue fever, you should use pain relievers with acetaminophen and avoid medicines with aspirin, which could worsen bleeding. You should also rest, drink plenty of fluids, and see your doctor. If you start to feel worse in the first 24 hours after your fever goes down, you should get to a hospital immediately to be checked for complications. There is no vaccine to prevent dengue fever. The best way to prevent the disease is to prevent bites by infected mosquitoes, particularly if you are living in or traveling to a tropical area. This involves protecting yourself and making efforts to keep the mosquito population down. Stay away from heavily populated residential areas, if possible. Use mosquito repellents, even indoors. When outdoors, wear long-sleeved shirts and long pants tucked into socks. When indoors, use air conditioning if available. Make sure window and door screens are secure and free of holes. If sleeping areas are not screened or air conditioned, use mosquito nets. If you have symptoms of dengue, speak to your doctor. To reduce the mosquito population, get rid of places where mosquitoes can breed. These include old tires, cans, or flower pots that collect rain. Regularly change the water in outdoor bird baths and pets' water dishes. If someone in your home gets dengue fever, be especially vigilant about efforts to protect yourself and other family members from mosquitoes. Mosquitoes that bite the infected family member could spread the infection to others in your home.